You know how one really cool article of clothing can make an otherwise boring outfit extraordinary? You can put on a plain pair of jeans and a nondescript shirt with a chic jacket, and you’re ready for a night on the town. That special hat gives you a look that catches peoples’ eye. A sylish belt gives your outfit a real pop. I think sauces do the same thing for food. A sauce can dress up an ordinary dish and take it to a new level. A creamy Hollandaise sauce elevates asparagus to something special; a Bearnaise sauce plays exceptionally well with a filet; and a beurre blanc sauce makes a fantastic accompaniment to a snapper filet. A sauce transforms everyday fare to a dinner party-worthy meal. I’ve been relentless in my commitment to eating less meat so far this year. I’ve had almost no red meat since the holidays, so I decided it was time to break that trend. My inner carnivore urged me to walk past the meat counter this weekend, so I relented and picked up a flank steak. My inner carnivore smiled. I decided that a grilled flank steak needed something saucy to dress it up a bit. I wanted to make a sauce that I’ve never made before, and after perusing some cookbooks for a few minutes, a Romesco sauce jumped out at me. Romesco originated in Catalonia in the northeastern part of Spain. The primary ingredients of this sauce are almonds and roasted red peppers. I added some roasted Roma tomatoes as well. Garlic, red wine vinegar, and olive oil round out this smooth, rich sauce. This versatile sauce works well with just about anything, including seafood, chicken, or vegetables. 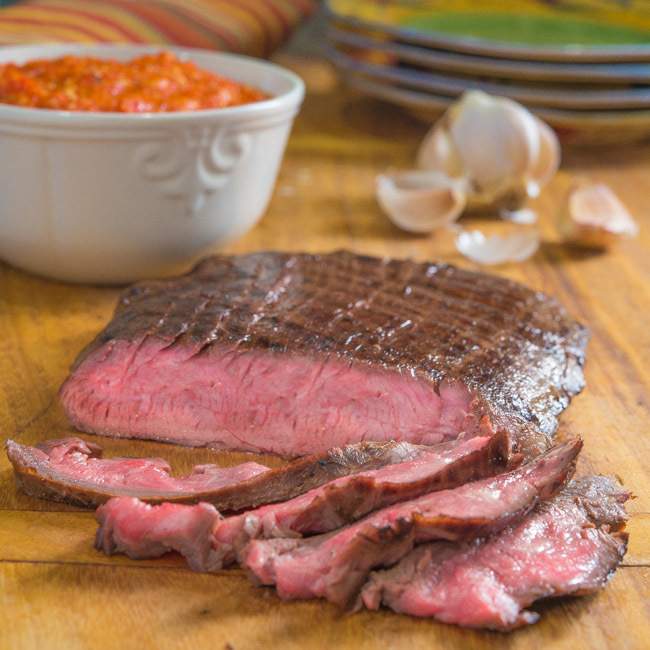 A dinner of marinated and grilled flank steak dressed up with Romesco sauce capped off a great weekend. 1. Preheat oven to 400 degrees. Place almonds and tomatoes on baking sheet and place in oven. Let almonds toast for 5 to 8 minutes until they are slightly browning. Remove from baking sheet. Let tomatoes cook for an additional 6 to 8 minutes. Remove from oven and cool. 2. Place almonds, tomatoes, garlic, vinegar, paprika, peppers, salt, and pepper in the bowl of a food processor and process until smooth. With the processor still running, slowly add oilve oil until incorporated. Transfer sauce to a small bowl, cover with plastic wrap, and refrigerate until ready to use. 1. In a large bowl, whisk together vinegar, mustard, honey, salt, pepper, garlic powder, onion powder, and paprika until well incorporated. Slowly drizzle in olive oil whisking continuously. 2. Place flank steak in marinade, turning to completely coat. Cover bowl with plastic wrap and refrigerate for 2 hours. 3. When ready to prepare, remove steak from bowl and wipe off excess marinade with a paper towel. Preheat a grill pan over high heat. 4. Transfer steak to grill pan and cook for 3 to 4 minutes on each side. Cooking time will vary according to thickness of steak and desired doneness. Using a instant read thermometer, remove steak when the temperature reaches 130 degrees for medium rare, 140 degrees for medium, or 150 for medium well. Cover steak loosely with aluminum foil and rest for 10 minutes before serving. 5. Slice steak thinly across the grain and serve immediately with Romesco sauce.